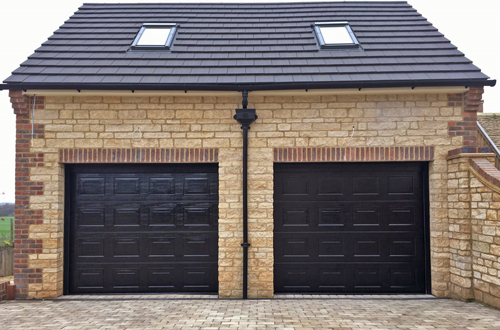 Sectional Garage Doors are rapidly growing as one of the most popular choices of garage door in the UK. Their strength, safety and security are just some of the many benefits that justify this popularity. They are known as 'Sectional' doors due to their construction, being made of separate sections which open vertically. This means that sectional garage doors can be installed on almost every shaped opening (rounded, arched etc.). Most sectional doors are double skinned as standard, with panels filled with insulating foam 40mm to 45mm thick. These sections are generally constructed from galvanised steel for strength and longevity. The efficient and impressive construction of a \ectional door provides strength and stability not possible in other doors, even in larger than normal sizes. As a result, significantly larger garage openings can be accommodated through the use of a sectional door. Sectional garage doors open and close vertically, meaning space around the opening can be utilised. This is perfect for shorter garages or driveways, allowing vehicles to be parked up against the door without needing space to 'swing out' when opening the door. The door panels curve upwards over the opening and then back into the headroom of the garage. When fitted and specified accurately, unlike other garage door types, a sectional can offer full drive-through height and width. This is an ideal solution for garages that require large vehicle access, or have limited access dimensions. 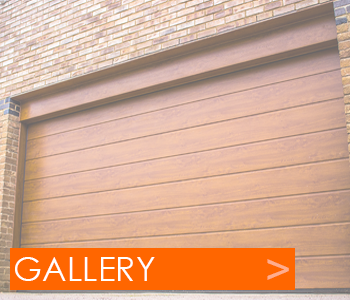 We work with a number of high quality manufacturers of sectional garage doors, meaning we have an extensive range that allows you to choose the perfect door for your garage. Simply click the images below to find out more! The mechanical design of a Sectional garage door is notably different to Up and Over garage doors. 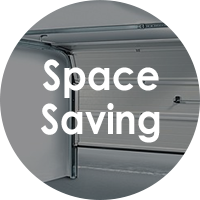 The spring system provides a much smoother operation than a conventional Up and Over door, which is particularly useful on larger sized doors. 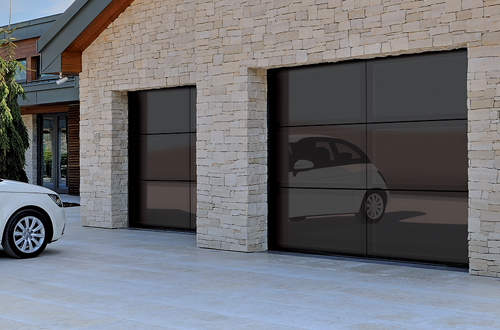 All Sectional garage doors can be either manually or electrically operated, remaining smooth and quiet in both cases due to excellent engineering, flawless design and high-quality components. Sectional door panels offer safe operation, with anti-entrapment design between the sections to prevent finger trapping, and a number of other safety features that meet all current legal regulations. 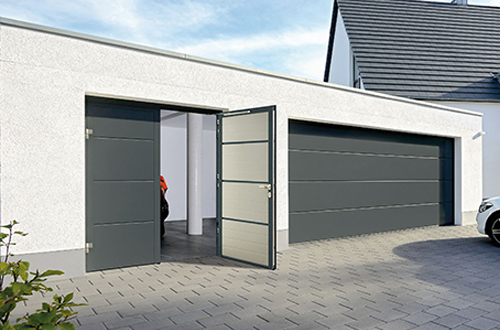 Please refer to the video below to find out more about the operational features of a sectional garage door - in this case, the door is manufactured by Hormann. 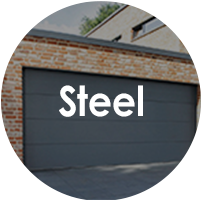 Sectional doors are largely constructed from galvanised steel, although aluminium and timber doors are available. Most manufacturers offer woodgrain finishes with their steel doors, giving the insulation and security of steel, with the aesthetic impression that only wood can deliver. 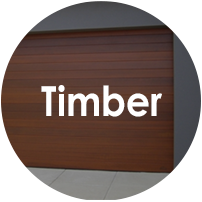 With Timber Sectional doors, the choice of wood differs between manufacturers. The choice of softwood or hardwood include Hemlock, European Oak, Iroko, Accoya, Mahogany and Cedarwood. Timber doors are only available up to 8 feet (2134mm) wide in Up and Over form, whilst timber Sectionals can be manufactured up to 5 metres wide (over 16 feet)! 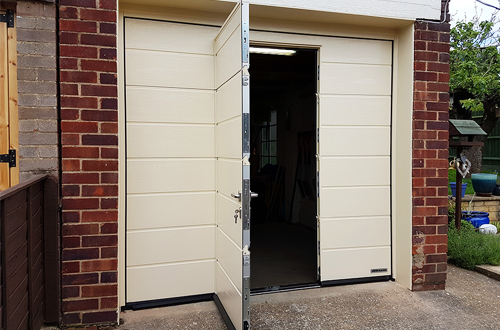 If your garage is utilised as a room such as an office, workshop or gym, a sectional door is a fantastic choice to insulate and protect your belongings. 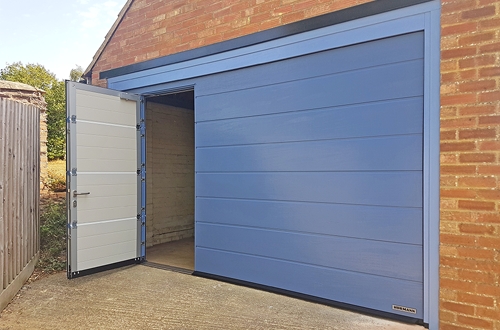 Sectional doors are built to maintain constant temperature within the garage, perfect for applications where temperature control is a factor. Therefore, a sectional garage door is perfect for valuables and car collectors alike, preventing damp, damaging conditions. 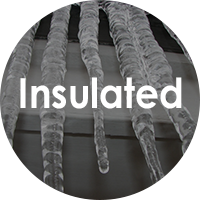 When properly installed, an insulated sectional door will provide an impressive U-Value rating, and reduce any heating costs on adjacent rooms as a result. Some doors come with optional rubber seals to further improve the insulation qualities. 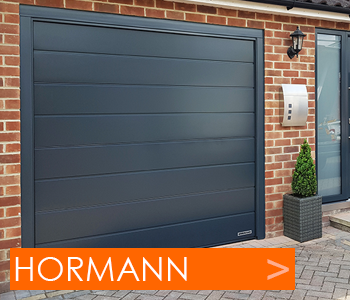 The image to the right shows the thickness of Hormann's LPU 67 sectional, the most insulated door available, next to the 42mm thick insulated and non-insulated door panels. Double skinned, insulated sectional doors offer strong security qualities. Combined with a quality electric operator, a sectional door can be almost impossible to break into, especially without specialist tools and lots of noise! The Hormann Supramatic and Promatic Bi Secur electric operators have additional locking in the operator boom in the form of a steel hook; this holds the door panels firmly at the top, as well as it being held by the motor itself. 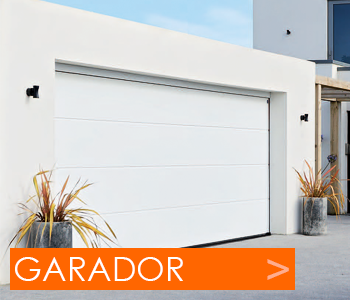 Electric operators from Garador, Marantec, Carteck and Somfy also offer high quality specifications and security. 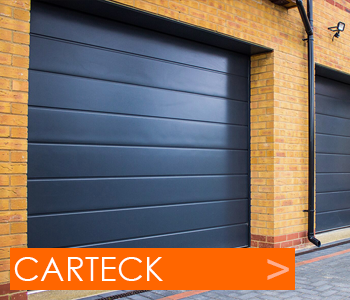 All insulated Sectional garage doors supplied by The Garage Door Centre are CFC free, foam-filled, and manufacutred with double-skinned, galvanised steel panel construction. We don't supply single skin panels with polystyrene stuck to the inside face. The 42mm thick panel construction provides incredible strength, whilst reducing damage from knocks and bumps. 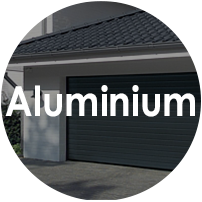 There is a wide variety of finishes and effects available for sectional garage doors, which is often pressed onto the door at the manufacturing stage. High quality paint finishes are also available, including a range of woodgrain effects designed to match existing building and wood work. A surge in demand for designer elements has lead to a number of manufacturers offering both standard and bespoke designs. Not only have we seen a huge increase in the demand for special surface finishes like Titan Metallic, we have also seen a demand for stainless steel elements. Hormann's T Ribbed design is just one example of steel elements, with striking horizontal lines creating a stylish finish. 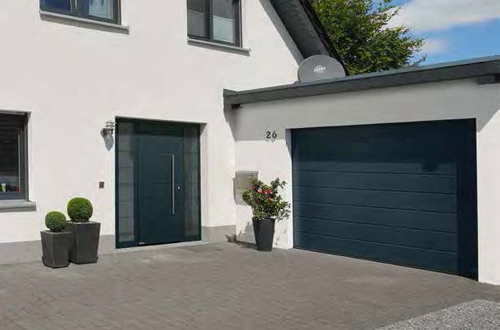 A true masterpiece of engineering; the optional pedestrian door, also known as a wicket door, is a superb solution for a household using their garage regularly, but not primarily for a vehicle. Access to the freezer, tools or bikes is easy with the large convenient wicket door, which can be used without opening the entire garage door. The bottom threshold is only around 10mm, allowing easy access to bicycles, scooters and wheelchairs. Wicket inset doors are only available in the 42mm double skinned insulated option, due to panel strength required. 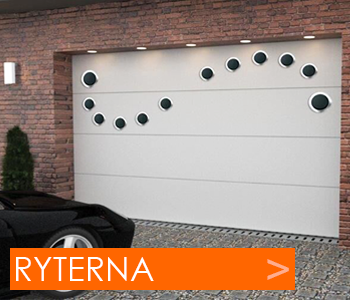 Manufacturers for this type of sectional garage door include Hormann and Carteck. All manufacturers of Sectional garage doors offer the handle as an option.The handles and locking methods offered vary considerably, from single-point rotary latch to cable operated double latch. 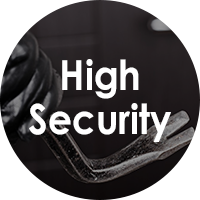 Black handles are the standard with euro profile cylinder locking, although many coloured or metallic finishes are offered by most manufacturers. Sectional garage doors do not have a sub-frame like an Up and Over door, but do require a structural surface to install directly to. If installed inbetween the opening, a specialist installation kit is required. The frame is not box-section like with Up and Over doors, and is also not a head and legs that lock together. The frame section is essentially only to carry the operating gear and spring mechanism, and relies on a good, straight, sound surface to install onto. When the door is installed inbetween the opening you will always require a cover strip of some kind. This is because the legs are pre-drilled for fitting behind the opening, as well as being only available in limited colours. These strips can be timber, Upvc or specially designed cover strips available from Hormann. All Sectional garage doors come with high quality rubber weatherstrips built into the bottom door panel, the sides of the frame legs, and the top panel fascia or door panel. When properly installed with a level floor, the sectional door can provide a very high level of sealing against wind, rain, dust and vermin. A great increase in the demand for ‘designer’ type sectional doors has driven manufacturers to produce doors with the flexibility to use almost any material on the front face. The ‘facade’ sectional door offered by Hormann is an adaptation of a commercial door, with the mechanism adapted to enable the customer or contractor to plant timber and other materials onto the front face. This means you can make either a bold statement in design, or subtly blend the door into the rest of the building. 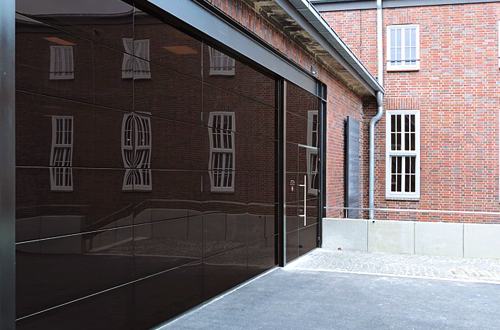 Hormann also offer the ALRF42 Vitraplan to meet the demands for ‘glass garage doors’; an increasingly popular request. Offset flush glazing cleverly hides the framework and door panel divisions with a choice of glazing options. The standard ALRF42 offers real glass in a framework with double or triple glazing options. Sectional doors are extremely versatile when it comes to sizing for two main reasons. Firstly, a Sectional garage door does not swing through the opening, meaning that when installed behind the opening the exact size of the door is not as important. Steel fixing frames are designed to concealed (or partly visible), meaning that this is not an issue. This means that larger doors can be fitted to smaller openings, increasing the range of doors that can be ordered for any given dimensions, and perhaps elimating the need for made-to-order doors in some situations. Secondly, the strength of the panel means that large dimensions are achievable, particularly with double skinned panel doors. With heights up to 3000mm and widths of up to 8000mm, there is a Sectional door to suit almost every domestic application. Purpose made sizes are available in, Steel, Timber and aluminuim, although there are a large number of standard sizes readily available. 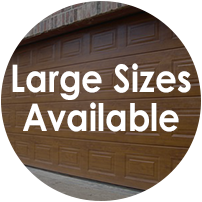 Note: Manufacturer’s ‘order reference sizes’ for Sectional garage doors always refer to the exact structural opening sizes when the door is being installed to the inside face. Originally, Sectional doors were designed to be fitted behind the opening, limited by the positioning of the springs and the guides. However these doors can now be fitted inbetween the opening through the use of adapted installation kits and alternate gear mechanism options. Specially designed, bespoke fascias and panelling can also be used to accommodate any opening. The only spatial requirement for Sectional doors is the headroom needed for the curve of the tracks, and then for the horizontal storage of the door panels when in the open position. 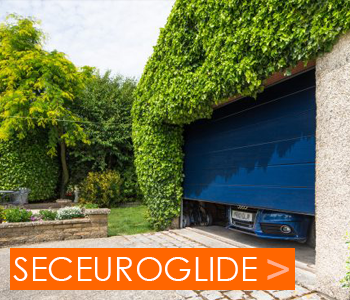 If limited headroom is an issue, consider the Hormann, Seceuroglide and Garador Z track system (single door sizes) or the Carteck range of sectional doors for garages with limited headroom internally. Sectional garage doors have a varied choice of either torsion or tension spring lifting mechanisms. The spring position can be either side mounted tension, front mounted torsion, rear mounted torsion or horizontal. Some manufacturers also produce doors with springs set into the horizontal guide channels at high levels. Each option requires a slightly different headroom requirement, and the important structural fixing points vary for installing the springs and tracks. Proper installation of these springs can be paramount to correct, trouble free, safe operation. All European manufacturers now provide zinc plated or galvanised springs as standard, with inferior spring operating mechanisms coming from American manufacturers. A sectional garage door paired with a quality operator can create one of the most secure garage doors available on the market. With a Sectional garage door, manual or electric operation delivers equal levels of security, mainly due to the design geometry and gear mechanism. All Sectional garage doors can be automated easily, which is due to their well balanced operation at all sizes.The four main manufacturers, Hormann, Carteck, Garador and SeceuroGlide, all have different spring-lifting operation methods, but the one common factor is ease of operation. The latest electric operators, such as the Hormann Bi Secur, feature hi-tech two-way communication between the operator and the handsets. This prevents unauthorised operation, and in some cases allows for more than just "Open/Close" commands. The best levels of security will be obtained by using an operator with a built-in, anti-force mechanism built into the towing arm area. A remote control electric operator is highly recommended if the garage is used regularly for vehicle storage, or if the door is over 3m wide. 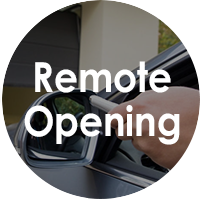 The convenience of remotely opening a garage door is remarkable, especially on wet and dark nights when unlocking and manually opening a garage is the last thing you want to do. Click below to find out more about our range of electric operators in the Product Catalogue. The video below shows the transformation of a garage door - going from an old up & over do to a new, insulated sectional garage door. This is just one of the many amazing transformations that we are able to undergo - make sure you watch to the end to see the electric and smooth door in operation.